Garlic is shooting up once again. 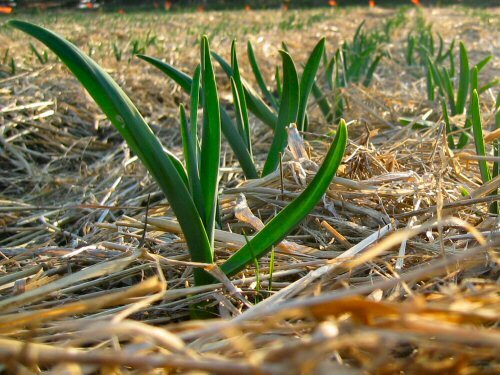 Although we’re only five days into a nice warm weather stretch, this year’s crop of Music seems to be at almost the same place as last year’s garlic in the all-mild April of 2006. You can see it growing by the day. Elsewhere in the field, things are moving ahead faster and with more on the go than ever before, with Conall (the all-new organic grower) picking up new field skills practically by the hour. Let’s see how things continue to shape up! That garlic looks really good! Is Music an heirloom variety or hybrid? Amanda: Music is a hardneck garlic that, as far as I know, is propagated exclusively from cloves (asexually reproduced, clone), so it’d be as heirloom as it gets. It’s named after Al Music, who popularized it around here, the one variety at the seed houses I use. I read that it was a variety he brought from Italy. A neighbor right across the fence used to grow garlic for sale and actually knew Mr. Music… I don’t think there’s much if any hybrid garlic available in general, they only discovered fertile garlic and how to produce garlic seed in the last 20 years or so, it’s apparently been propagated exclusively by cloning from cloves for thousands of years! (I qualify everything because I grow less trusting of the accuracy in history and scientific conclusions practically by the day… :) It’s good garlic, strong and flavorful, that much I know from first-hand experience!